The competition for Eastbourne’s Iconic Beach Competition has reached its climax as judges announce the winners. The winners are: – Stephen Foley from Dublin based SFA for his illuminated ghost-like structure What Unearthed? ; Jacob Low from Jak Studio for his window on the world Spyglass, George King from London and Melbourne based George King Architects for the stellar designs of Star Gazers’ Cabin and Ewen Miller and Kim Smith from the RIBA Award winning Calder Peel for the joyfully bright sun-filled Eastbourne Rebourne. 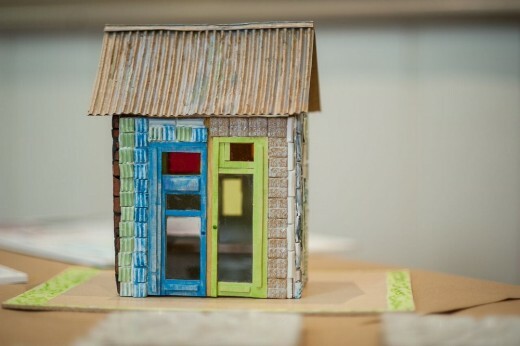 The winner in the community category is local artist Sheila Hay and students from Sussex Downs College with their beautifully crafted ceramics hut. 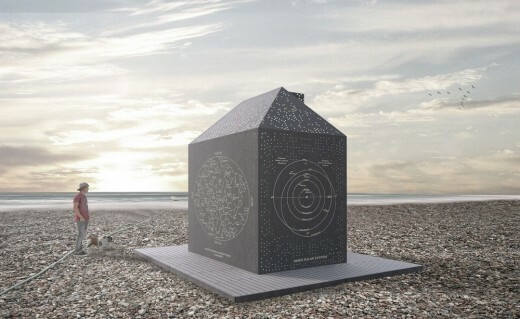 The five bespoke designed iconic huts will be sited at key locations in Devonshire ward, to the east of the pier, forming part of the route of the Coastal Culture Trail linking three award winning galleries: Towner Art Gallery in Eastbourne, De La Warr Pavilion in Bexhill and Jerwood Gallery in Hastings. 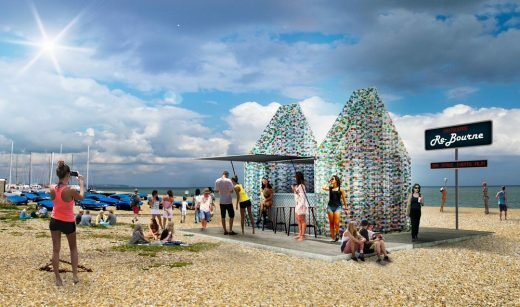 The beach huts will be key landmarks along the seafront, harnessing the resurgence of interest in coastal communities, attracting new visitors to Eastbourne and becoming symbols of Eastbourne; matching high quality design, visual flair and function. Last September, as part of the council’s major regeneration initiative Driving Devonshire Forward, a call was issued for submissions of designs for new beach huts to become landmark symbols of the town’s Devonshire ward. The aim is to create new visitor attractions and enhance Eastbourne’s reputation as a town embracing culture and design. The project invited submissions from two separate categories – one from practicing, registered architects and the second from members of the community to work with the project’s consultant architect. Following an overwhelming response, with over fifty entries from all over the world in the architects’ category, a longlist of twelve was announced in December followed by a shortlist of eight architects entries and three community entries in January. “This concept of The Huts Eastbourne is a brilliantly charming and innovative way of marrying culture and community, delivering visually engaging multi-functional spaces for all to enjoy. These unique and eclectic structures are full of personality and will adorn the seafront with sculpturally interesting moments that contribute to Eastbourne’s individuality. British beach huts are full of charm and happy memories, and by giving the local community the opportunity to vote for their preferred designs, these contemporary reimaginations have the best possible chance of engaging all generations in an equally endearing, popular and memorable way”. The judging panel comprised Martin Jones, Senior Programme Manager – Regeneration, HEDP, Annie Wills Head of Tourism, Eastbourne Borough Council, Cllr Margaret Bannister Driving Devonshire Forward Steering Group representative, architect Jane Montague and special guest judge, ground- breaking sculptor Alex Chinneck. Alex has been the mastermind behind succession of major public artworks that have captured international admiration and attention. These include: sliding the entire brick facade from a house into the front garden of the property; completely inverting two four-storey commercial buildings; constructing a full-size house from 7500 wax bricks that proceeded to melt over thirty days; and creating the illusion that a stone building on London’s iconic Covent Garden Piazza had miraculously levitated into the air. Alex has recently completed a landmark project for the London Design Festival 2015; his biggest undertaking to date. Eastbourne is the largest coastal town in East Sussex. It offers an increasingly attractive and popular environment for people to live and work; high quality facilities, proximity to the South Downs National Park and employment opportunities alongside its more traditional role as a holiday destination for 4.1m day visitors per year and 2.04m staying night trips. The Housing and Economic Development Partnership (HEDP) is a partnership between Eastbourne Borough Council and Eastbourne Homes Ltd. HEDP’s role is to provide new homes, bring empty homes back into use, neighbourhood regeneration and economic development across the borough, with a focus on Devonshire ward. Devonshire ward lies to the east of the town centre; it includes the seafront from the pier east to Sovereign Leisure Centre. The ward contains all land uses typical of a resort town centre, from shopping and venues for nightlife, large hotels, small hotels and guest houses, family homes and houses in multiple occupation (HMOs). As such it reflects the diversity of Eastbourne and has many of the factors both positive and negative that often characterise town centres of seaside resorts. In 2013 HEDP commissioned an urban design study of the ward to formulate and develop a vision for the social and physical regeneration of the ward. The community were at the heart of this project, which resulted in Driving Devonshire Forward (DDF). The DDF is the community’s strategic vision and plans for the ward, the regeneration ‘branding’ and sets the guiding principles for all projects. The seafront is a strategic regional attraction, fulfilling its potential through cultural and sporting activity and use by the community as a local amenity. The emerging EBC seafront local plan will shape and define the tourist offer. The tourist industry is an important part of a diversified economic portfolio. It is important to note one of the most encouraging trends in recent years has been the recovery in the British seaside industry. This has been driven in part by the progress some seaside towns have made in carving out a niche offer, and the success of schemes to promote England as a destination. Several seaside towns have successfully been re-branded on a coherent cultural programme. The ward’s specific context justifies a bespoke approach. 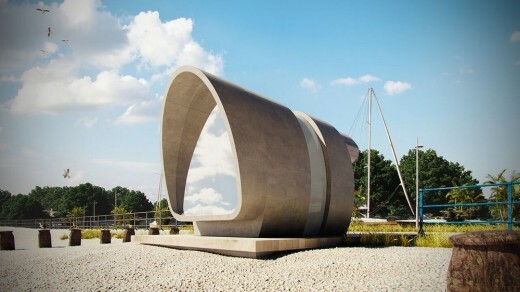 New landmarks in key public spaces, for example at key junctions or on the beach, with an extraordinary design brief, can act as catalysts to regenerate a local area. Eastbourne, like many other coastal towns, provides beach huts as part of its visitor offer. Currently there are 87 huts and 69 brick built chalets at six locations, all west of the pier. There are currently no beach huts east of the pier. However, there are key visitor seafront attractions: Redoubt Museum, Treasure Island, Spray Watersports Centre, Fort Fun and Princes Park. The council are installing 20 traditional huts to the east of Spray Watersports in addition to the 5 iconic huts. B&R Productions Ltd has been appointed by EBC to manage the competition on their behalf up until the announcement of the winning designs. B&R Productions has appointed Simon Barker of Barker Shorten LLP as Project Architect to work with the community on developing their ideas. EBC will thereafter contract him to realise the selected scheme for the Community Project Hut.